I have mentioned this many times, but Cosme-De is one of my favourite websites when it comes to beauty products. It is like a beauty bloggers dream with so many different beauty brands with many of the products being cheaper than what they are on the UK high street. Cosme-De are celebrating their 7th anniversary this month and they have some really fun promotion happening. If you spend over $169 you get a free teddy bear which I will talk more about in a second as well as many other things, you can find out more information here. Swatched: Top is Clinique Chubby Stick Highlight and Bottom is Dior Lip Glow. How cute is that little teddy bear! I have fallen a bit in love with him and I think he needs a name soon. It is honestly one of the softest teddy bears I have ever had and I love the attention to detail on him. His little pink top has the Cosme-De website on as well as a little 7 for the anniversary, there is also little touches like that on the back of the top too. As I mentioned, you need to spend over $169 to get one of these little cuties. The first two have already sold out and the next two have to be ordered within a certain period, all information is about this is here. The first thing I picked was the Clinique Chubby Stick Sculpting Highlight* in 02 Super Starlight. It is such a gorgeous highlight without being overly glittery, although you will need a light hand with this or you could end up looking like a disco ball. I believe this shade is exclusive to Asia but I am so glad to have it, it is such a gorgeous champagne shade. I apply it directly to the tops of my cheek bones and blend it out with a fluffy brush. This highlight retails for £17. 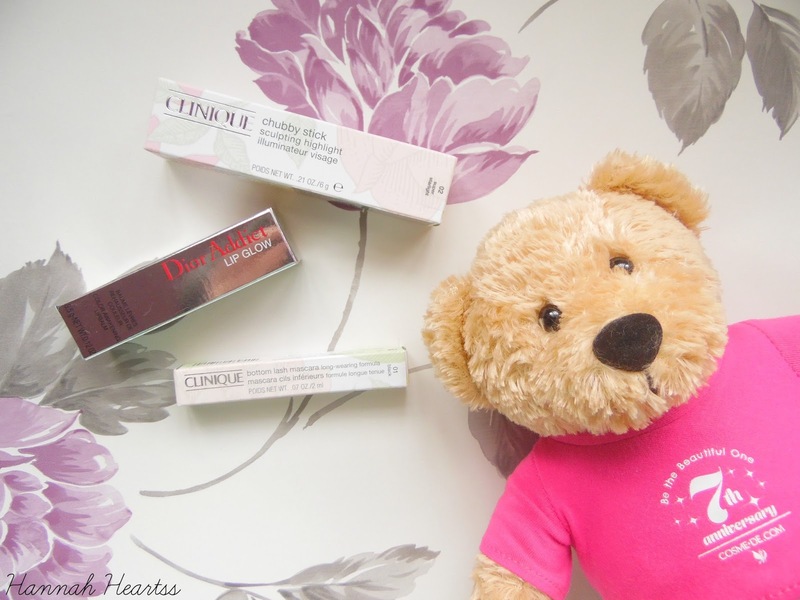 Next I picked the Dior Addict Lip Glow*. I have wanted this product for the longest time and I am so happy to finally have it in my life. It gives my lips the prettiest pink colour while keeping my lips hydrated and not feeling like they are covered in layers of product. The packaging is absolutely gorgeous in true Dior style and I already know this is going to be a must have in my handbag. 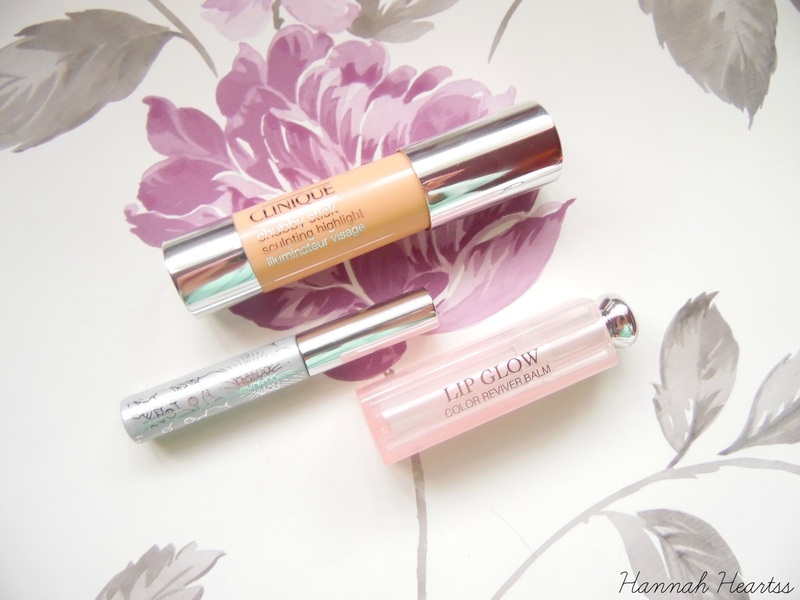 This lip glow retails for £18 which is such a bargain! The final product I picked up try was the Clinique Bottom Lash Mascara*. Again this is another product I have wanted to try for ages after seeing so many YouTubers love it and I am here to report all good things so far! Not only is the packaging super gorgeous with a flower design but is also does exactly what I wanted it to. It applies the perfect amount of mascara to my bottom lashes without transferring onto the skin and doesn't melt off throughout the day! Very impressed with this and the wand actually reminds me of Benefit Gimme Brow just for your eyelashes! This retails for £12.